Is Wipro Limited (NYSE:WIT) going to take off soon? Some money managers are taking a bullish view. The number of long hedge fund positions moved up by 2 during Q4. This isn’t necessarily a bullish indicator as our calculations also showed that WIT isn’t among the 30 most popular stocks among hedge funds. Let’s take a look at the key hedge fund action surrounding Wipro Limited (NYSE:WIT). What have hedge funds been doing with Wipro Limited (NYSE:WIT)? At the end of the fourth quarter, a total of 10 of the hedge funds tracked by Insider Monkey were bullish on this stock, a change of 25% from the second quarter of 2018. 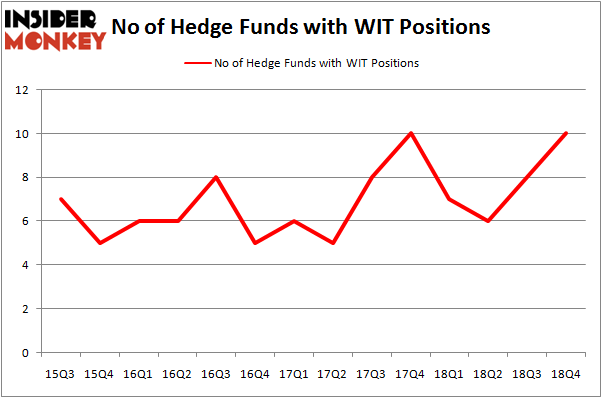 On the other hand, there were a total of 7 hedge funds with a bullish position in WIT a year ago. So, let’s review which hedge funds were among the top holders of the stock and which hedge funds were making big moves. 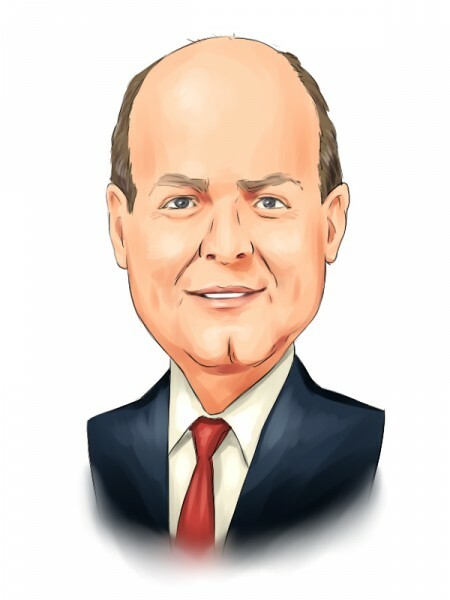 Of the funds tracked by Insider Monkey, AQR Capital Management, managed by Cliff Asness, holds the biggest position in Wipro Limited (NYSE:WIT). AQR Capital Management has a $32.5 million position in the stock, comprising less than 0.1%% of its 13F portfolio. Sitting at the No. 2 spot is Ken Fisher of Fisher Asset Management, with a $23.6 million position; the fund has less than 0.1%% of its 13F portfolio invested in the stock. Remaining professional money managers with similar optimism include Ben Levine, Andrew Manuel and Stefan Renold’s LMR Partners, Ernest Chow and Jonathan Howe’s Sensato Capital Management and D. E. Shaw’s D E Shaw. With a general bullishness amongst the heavyweights, specific money managers were breaking ground themselves. LMR Partners, managed by Ben Levine, Andrew Manuel and Stefan Renold, assembled the most outsized position in Wipro Limited (NYSE:WIT). LMR Partners had $7.3 million invested in the company at the end of the quarter. Sensato Capital Management also made a $3.9 million investment in the stock during the quarter. The following funds were also among the new WIT investors: Simon Sadler’s Segantii Capital, Ken Griffin’s Citadel Investment Group, and Dmitry Balyasny’s Balyasny Asset Management. Let’s check out hedge fund activity in other stocks similar to Wipro Limited (NYSE:WIT). We will take a look at IQVIA Holdings, Inc. (NYSE:IQV), Archer Daniels Midland Company (NYSE:ADM), Hormel Foods Corporation (NYSE:HRL), and United Continental Holdings Inc (NASDAQ:UAL). This group of stocks’ market caps resemble WIT’s market cap. As you can see these stocks had an average of 36.25 hedge funds with bullish positions and the average amount invested in these stocks was $2990 million. That figure was $78 million in WIT’s case. IQVIA Holdings, Inc. (NYSE:IQV) is the most popular stock in this table. On the other hand Hormel Foods Corporation (NYSE:HRL) is the least popular one with only 18 bullish hedge fund positions. Compared to these stocks Wipro Limited (NYSE:WIT) is even less popular than HRL. This means hedge funds in general don’t consider WIT as an attractive investment opportunity. Our calculations showed that top 15 most popular stocks among hedge funds returned 19.7% through March 15th and outperformed the S&P 500 ETF (SPY) by 6.6 percentage points. As you may have guessed WIT wasn’t in this group. Two new hedge funds that bet on WIT were disappointed as the stock lost 21.2% and underperformed the market by a huge margin. If you are interested in investing in large cap stocks, you should check out the top 15 hedge fund stocks as 13 of these outperformed the market.